I decided I have too much stuff. My storage room is busting at the seams and it is time to start liquidating some of my assets. I decided to send two of some of the best jerseys that I have to Goldin Auctions. 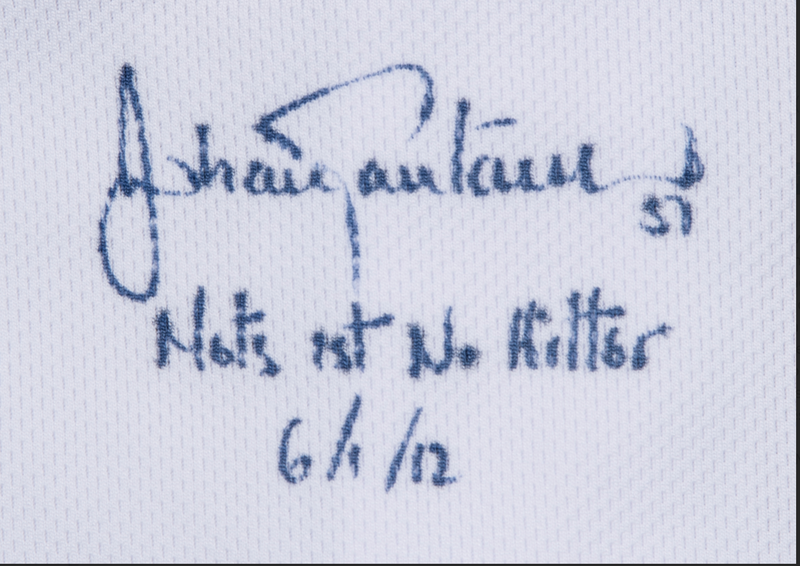 New York Mets hitting coach Dave Hudgens wore this white New York Mets home jersey on June 1st, 2012, during Johan Santana’s historic no-hitter against the St. Louis Cardinals. Santana threw 134 pitches in this game, striking out eight Cardinals as he threw the first and to-date only no-no in Mets franchise history. 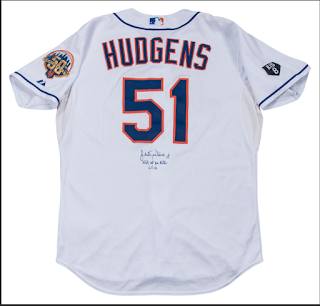 This button-down New York jersey has “Mets” and Hudgens’ number “51” sewn across the chest in blue and orange tackle twill. “HUDGENS” and a second “51” are sewn on the back of the jersey in blue and orange tackle twill. A Mets 50th Anniversary patch is sewn on the left sleeve and a Gary Carter “Kid 8” memorial patch is sewn on the right. A Majestic size “48” tag is applied to the front left tail below a “51 48 ’12 S1” swatch. Johan Santana has signed the back of this jersey in blue marker, inscribing “Mets 1st No Hitter 6/1/12” below his signature. This jersey comes with a MLB Authenticated hologram (EK 048206). The Auction goes live on Monday 4/15/19.. Click here for this jersey. Bidding starts at $150. 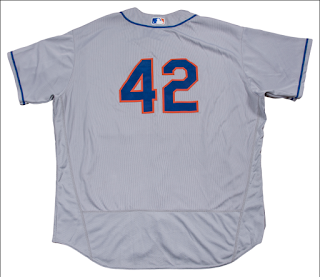 New York Mets ace Bartolo Colon wore this gray Mets road jersey on April 15th, 2016 against the Cleveland Indians at Progressive Field. The Mets won this game 6-5 with Colon pitching 5.1 innings to earn the win. Colon allowed two earned runs as his victory tied him with Pedro Martinez for second all-time in wins amongst Dominican born pitchers. 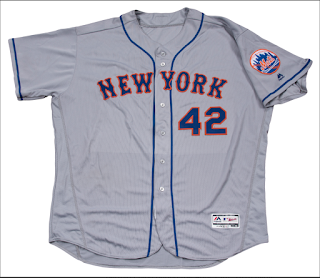 This offered Mets button-down road jersey has “NEW YORK” and “42” sewn on the chest in blue and orange tackle twill. As April 15th is the anniversary of Jackie Robinson breaking baseball’s color barrier, all players wear the number “42” to commemorate the historic event. A second “42” is sewn on the back of the jersey, also in blue and orange tackle twill. A Mets skyline logo patch is sewn on the left sleeve above a blue Majestic logo. The sides and back tail of this FlexBase jersey are constructed of a gray mesh fabric. A Majestic size “56” tag is applied to the front left tail. This jersey comes with a MLB Authenticated hologram (JB 368534) authenticating use of this jersey by Bartolo Colon during the April 15th, 2016 game. Mookie Wilson and Jim Bruer? Ed Kranepool found a kidney match. Are the Mets a good or bad team? Mets running out of minor league options? Vargas was just awful yesterday. Mets All Star Game Caps. Think Brody wears UNTUCKIT shirts? @MajorWFPod 2 was another funfilled time.